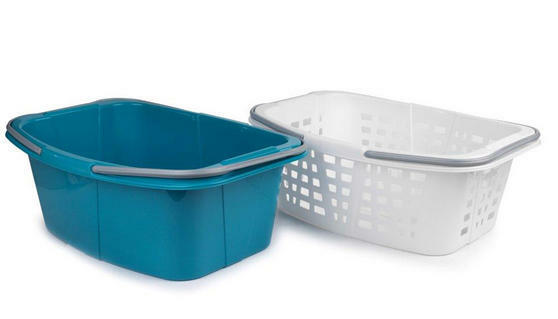 Sort your dirty laundry and freshly clean clothes with ease in these two fantastic Beldray laundry baskets. Made from strong plastic, the set contains one solid bowl style basket which is perfect for carrying damp laundry and one traditional lattice style basket which is ideal for carrying folded clean laundry. Whether you need to carry your clothes to the laundrette or just through the house, these baskets have durable handles making them incredibly easy to hold even when full or heavy. Make laundry easy with these two Beldray laundry baskets, perfect for sorting clean and dirty clothes at home or the laundrette. Each made from durable plastic, the strong baskets are easy to keep clean and can withstand a fairly heavy amount of laundry. Measuring 51 x 41 x 24 cm, they both have capacities of 26 litres so you can efficiently carry a whole load of laundry in one basket. In turquoise with grey handles, the solid bowl style basket is ideal for carrying wet laundry and can be used to soak items. The traditional lattice style basket comes in white with grey handles and is perfect for storing clean laundry ready to be put away.